We are just under six months away from the 23rd running of the Rock Island Grand Prix, and for many, it can’t come soon enough. The world’s largest and longest running street race brings racers from all over the world to the ‘Quad Cities’, a grouping of four cities in Iowa and Illinois, separated by the Mississippi River. The event takes over the Rock Island, Illinois downtown area over the Labor Day weekend, as racers arrive to compete on a fast and fun 6/10-mile course. The RIGP has been a ‘bucket list’ event for years, as racing around the city streets is a very rare opportunity. The atmosphere both on and off the track at the Rock is truly unmatched, with the three days serving as a festival for both racers and spectators. Roaming through old magazines for research on another story, I came across the original entry form for the first-ever Rock Island Grand Prix. As I was only 15 when they held the first event, and the Internet not exactly mainstream at the time, there is little to no coverage of that inaugural year. However, with the entry form in hand, I dove into what happened at the first ever Rock Island Grand Prix. The event began as an idea hatched by Tom Ott and Mike Berg to bring a karting event to the Quad Cities area. These two area racers presented the idea to the downtown business group, which had been organizing music festivals. At the time, the group elected not to pursue the idea, however, members of the local newspaper – The Argus – believed motorsports was on the rise and thought this would be different. The Argus is one of the oldest published newspapers in Illinois, founded in 1851. The newspaper staff tackled the event, branding it the ‘Rock Island Argus Gran Prix’. The RIGP promoters next looked for someone to run the race itself. At the time, the Professional Karting Association was hosting a number of street races in the region and was run by legendary karting figure Gus Traeder. After negotiations, Traeder’s PKA staff came to run the event, with the RIGP organizers helping to construct the track. 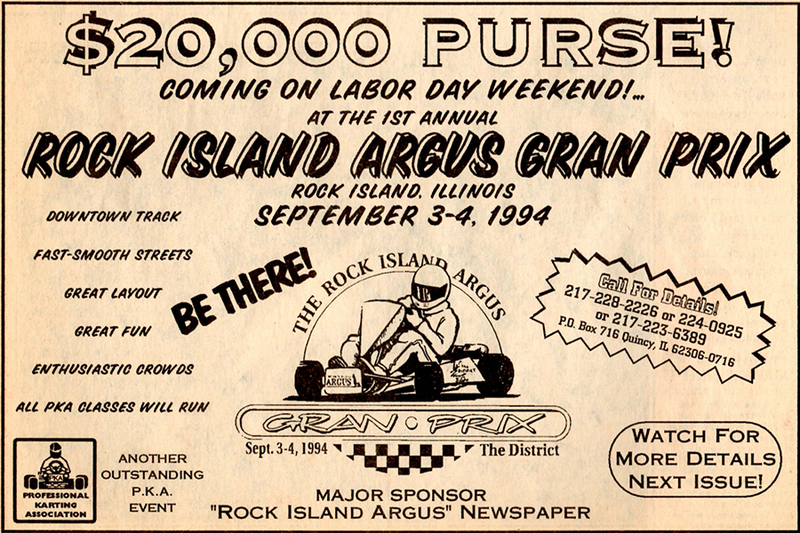 The highlight for the first Rock Island GP was the large purse. A $20,000 cash purse was put up for grabs, well above any other typical street race at that time. Today, $20,000 was the handed out twice at the SKUSA SuperNationals to Daniel Formal and Paolo de Conto for repeating in the headline categories. We’ve certainly come a long way. The first year was scheduled for 1993, however, the Mississippi River flooded heavily in many parts of its path. 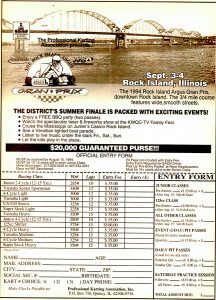 Everyone assumed that Rock Island was under water – which is wasn’t – and entry numbers were not high enough, which forced the cancellation of what would have been the first race. The event moved forward for 1994 and a total of 193 entries took part in 13 classes. Fast-forward and the race has become part of North American karting history, and continues to bring us new and exciting stories each year. The inaugural year was marked by the first victories for notable names who remain in the sport today. 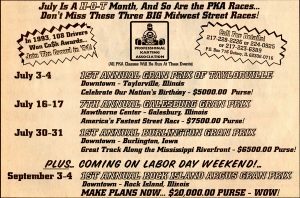 This September, another list of winners will go into the record books with the 23rd running of the Rock Island Grand Prix. Plans for the 2017 edition are being finalized with updates in the works to the event website – www.rockislandgrandprix.com – with registration set to open in April. Make sure to pencil in this Labor Day weekend – September 2-3 – on your racing calendar.